How gorgeous! I’ve got to try this! 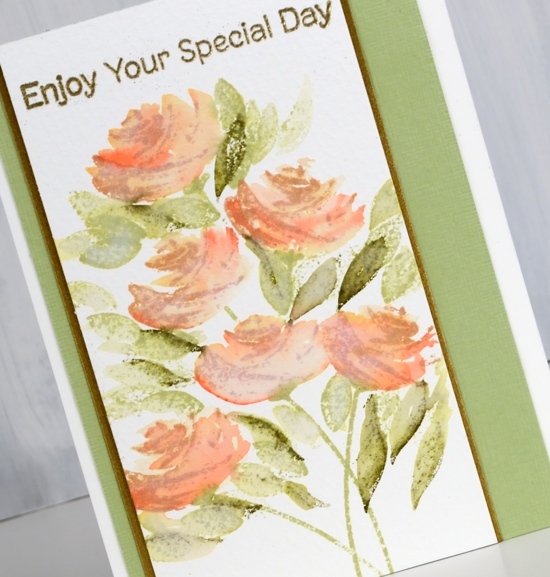 It is a fun way to get a different look from the layering stamps. 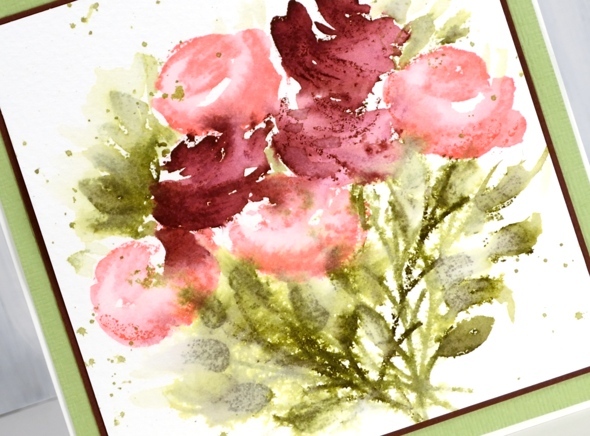 These are wonderful, and give a new simpler use for the layering stamps, (that to me are way too labor intensive). Also, big guffaw at this: “didn’t fling quite so much water”. Paints an interesting picture of you, Heather! Thank you for sharing! Even though I like to be neat and organized, what actually happens is that I end up working in a very small space in the middle of a rather cluttered big desk. So sometimes when I fling water around other things get wet! Thanks for your sweet comment; I hope you have fun with the technique. Gorgeous cards, I love the soft effects! These are really pretty. The perfection amount of definition for the flowers and leaves. I cannot believe you have ever made an “ugly” card ever. These are stunning! I just am not an artist as yourself, but I truly admire your talent! 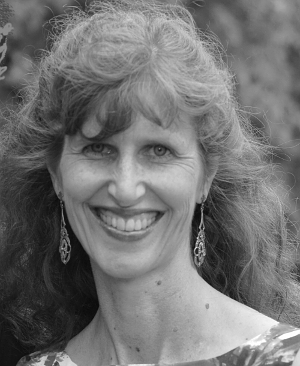 Thank you Tami for your kind words. Believe me there are some cards that get tossed out from time to time! The second card I just love, but I don’t quite understand what technique you are using. Is there a video? Thanks. Just love your unique and creative cards. Hi Mary, thanks for your kind words. Sorry there is no video so far; I’ll keep it in mind for the future. 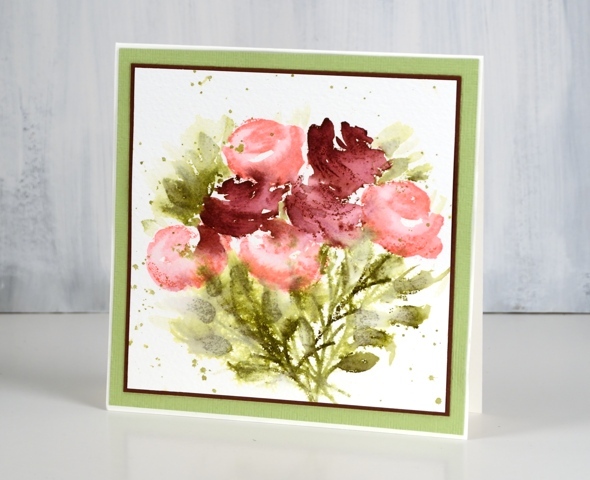 I love your cards – it’s a wonderful technique and they both certainly look hand painted! Thank you so much for sharing your lovely work. I think these look great. 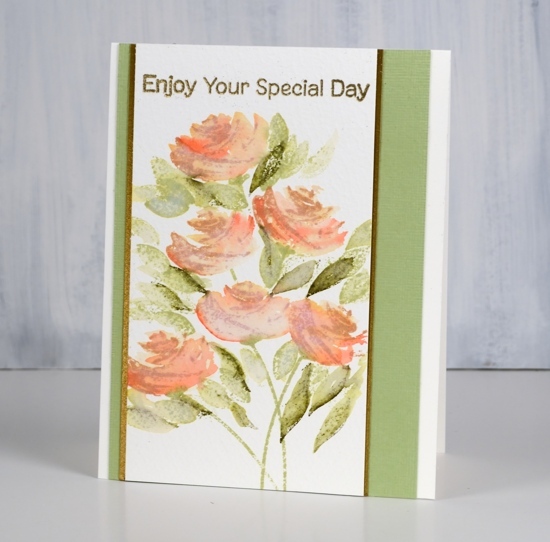 I love the colours of the first card – I tend to gravitate towards those colours and use them a lot.